The RevJet Marketing Creative Platform brings unprecedented power and sophistication to every ad creative discipline including Dynamic Creative Optimization (DCO), personalization, audience management, workflow, approvals, creative performance visualization, experimentation, and effortless self-optimizing performance competitions. The RevJet Ad Experience Platform is the first enterprise-grade SaaS platform that orchestrates meaningful, personalized ad creative experiences at scale. 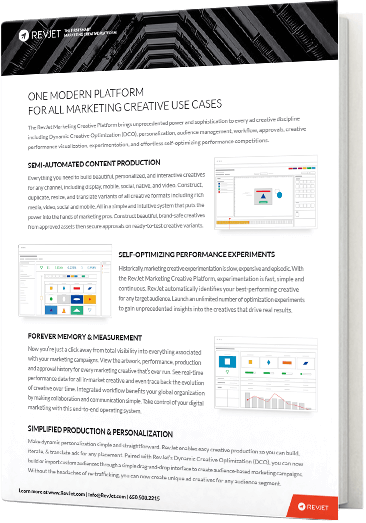 RevJet was purpose-built to power all ad creative use cases including DCO, personalization, audience management, creative performance visualization, experimentation, and self-optimizing performance competitions.